The 30-30 also looks great with a hollow ground drop point blade of 1.4116 high carbon stainless steel hardened between Rockwell 55 and 57 and still tough enough to withstand heavy use. The high polish of the three-inch blade physically seals the pores in the metal, increasing the knife's corrosion resistance. Stainless steel liners and spacers receive the same protective treatment. Mechanically, the 30-30 shows that a lot of planning went into the design. The blade's pivot bearing gets shielding from the wide bolster, cutting down on the contaminants that reach the bearing. Teflon bushings add permanent bearing lubrication. Buyers can choose between ebony and cocobolo handle scales, and either one is a fine natural handle material dense enough to repel moisture or oil instead of absorbing it. The knife opens one-handed with a push on the blade's thumb stud and locks in place with a strong liner-lock system. The 4-1/2-inch handle and three-inch blade are enough to dress out small game and even deer if you're careful. Since there's no pocket clip, you won't find the knife difficult to grip if you work for hours instead of minutes. 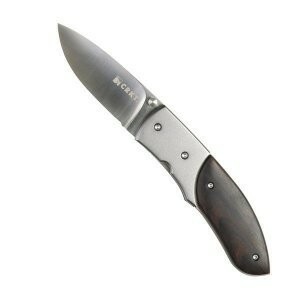 CRKT provides a contoured sheath of genuine leather for conveniently carrying the Russ Kommer 30-30 on your belt. See the Chugach Range for another CRKT Ross Kommer design in a fixed blade style.